As March now features as many blockbuster-type movies as the summer it is only fitting that we're now beginning to get full looks and extended trailers for some of the biggest summer 2017 films so as they might play in front of these March blockbusters. With Logan opening tonight and Beauty and the Beast in two weeks Disney is riding the good will of that Super Bowl ad and have released a full-length trailer for the fifth installment in their massive Pirates of the Caribbean franchise. While generally a fan of the original trilogy I can hardly remember much of anything about Rob Marshall's 2011 continuation On Stranger Tides. All of that said, this latest installment that is once again produced by Jerry Bruckheimer has courted directors Joachim Rønning and Espen Sandberg who are the duo behind the foreign adventure film Kon-Tiki from 2012 which was (not coincidentally) about a 1947 expedition by raft across the Pacific Ocean from South America to the Polynesian islands. Though the initial teaser wasn't much for conjuring up excitement, this new clip fully divulges the present situation of Johnny Depp's Captain Jack Sparrow and exactly why Javier Bardem's Captain Salazar is so hellbent to deliver death to Captain Jack by way of series newcomer Brenton Thwaites. While this will seemingly play as a revenge tale there is a lot to like in this trailer as, most importantly, it just feels like a lot of fun-which is what the original trilogy was drained of after the original. The special effects look downright amazing with young Johnny Depp deserving a second glance only because it was more convincing than initially imagined whereas another newcomer, played by Kaya Scodelario, certainly seems to be spicing things up. And while there is still no mention of Orlando Bloom or Kiera Knightley's involvement in the plot I like that they're saving a few surprises for if there is anything disheartening about this trailer it's that it shows too much. Pirates of the Caribbean: Dead Men Tell No Tales also stars David Wenham, Geoffrey Rush, and...Paul McCartney? This latest (last?) installment sails into theaters on May 26th, 2017. 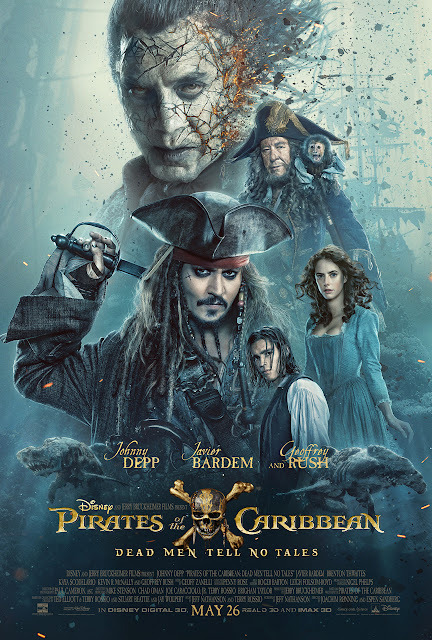 Synopsis: Thrust into an all-new adventure, a down-on-his-luck Captain Jack Sparrow finds the winds of ill-fortune blowing even more strongly when deadly ghost pirates led by his old nemesis, the terrifying Captain Salazar (Bardem), escape from the Devil’s Triangle, determined to kill every pirate at sea…including him. Captain Jack’s only hope of survival lies in seeking out the legendary Trident of Poseidon, a powerful artifact that bestows upon its possessor total control over the seas.